Actress Mbatha-Raw as Miss World 1970. Actress Mbatha-Raw plays Miss Grenada, Jennifer Hosten, who won the Miss World title in 1970. Here is a first look on how Miss World 1970 will look like in comedy-drama Misbehaviour, based on the true story behind the disruption of the 1970 Miss World contest by the newly-formed Women’s Liberation Movement. Production has now wrapped in the UK. 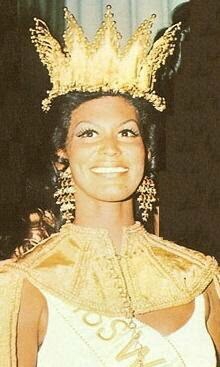 The actual Miss World 1970, beautiful Jennifer Hosten, of Grenada. Cast comprises Keira Knightley, Gugu Mbatha-Raw, Jessie Buckley, Greg Kinnear, Lesley Manville, Keeley Hawes, Rhys Ifans and Phyllis Logan, Suki Waterhouse, Clara Rosager, Loreece Harrison, Emma Corin, Lily Newmark, Emma D’Arcy, Ruby Bentall and Alexa Davies. Anyone else looking forward to the movie´s premiere??? Miss World 2019 to be held in Thailand!